Credit the dedication of passionate volunteers like Rusty Davis for finding the links to Michigan's first highway, Hull's Trace. It was part of the road carved out of the wilderness called Michigan and Ohio that followed well worn Native American trails and figured in the failed attempt to hang on to fort Detroit during the War of 1812. 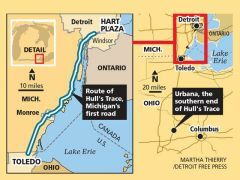 Some of that road, also known as Hull's Trace, follows existing highways, like M125 in southeast Michigan along the western shore of Lake Erie. 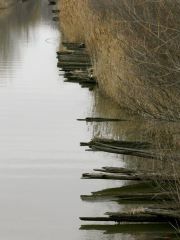 Other parts of the old highway can been seen poking out of the shallows of that shore when the water is low. 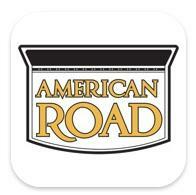 Our guest on this American Road Trip Talk is Rusty Davis. 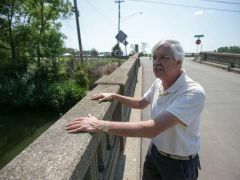 He is a volunteer at the River Raisin Battlefield Park in southern Michigan who has dedicated himself to uncovering and recognizing this historic byway. Rusty will uncover the fascinating story of Hull2019s Trace, a road that figured into the history of the War of 1812 and the development of Ohio and Michigan.